Claire Douglas, a student of American studies and studio art at Occidental College, was a summer intern in the American art department at Freer|Sackler. It’s easy to walk into the Eugene and Agnes E. Meyer Auditorium in the Freer Gallery without giving the bronze bust of Mrs. Meyer in the entryway a second thought. Head of Agnes Meyer, which was sculpted by Charles Despiau (1874–1946) in 1928 and installed in the Freer Gallery in 1992, is just what one might expect to find in a theater named after an old-money family—a conservative portrait in a traditional medium of a beautiful woman with downcast eyes, betraying little in her expression. Meyer’s name may ring a bell with Washingtonians—she was the mother of Katharine Graham, the legendary publisher of the Washington Post, and wrote for the Post herself. She spent the later part of her life as an activist for labor, civil, and women’s rights, earning her a spot on President John F. Kennedy’s Commission on the Status of Women. She was also passionate about Asian art, which inevitably led to a great friendship with Detroit industrialist and museum founder Charles Lang Freer. Agnes Meyer’s contributions to the founding and early history of the Freer Gallery were vast. She bequeathed pieces from her own priceless collection of Asian art to the museum and worked with curators and directors to ensure that the museum reflected Freer’s original vision. Significantly, only she and Freer’s secretary, Katharine Nash Rhoades, had carte-blanche in making new acquisitions for the museum after Freer’s death. 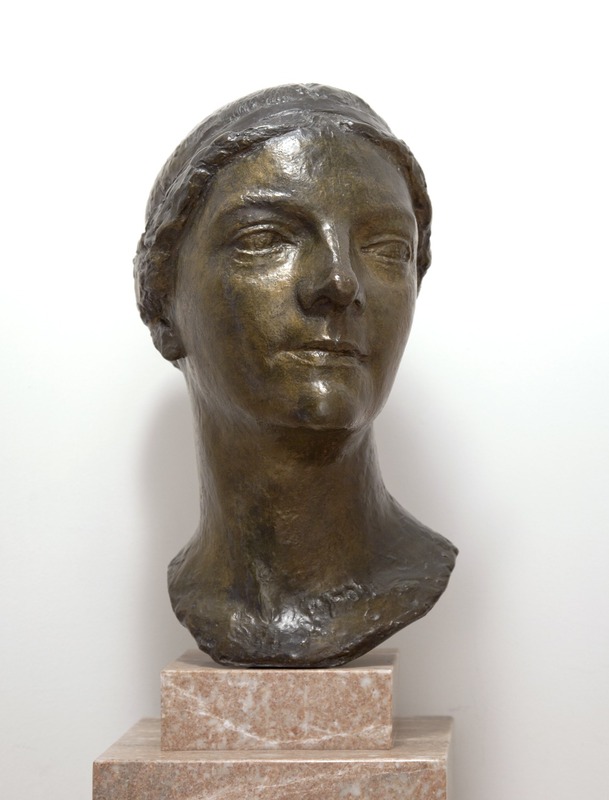 Mrs. Meyer’s official legacy as an accomplished and influential woman, whose public persona is embodied in Despiau’s bust, lives on after her death in 1970. Yet the story that Despiau’s portrait conceals in its conventional form is equally as interesting. Agnes Meyer, or Agnes Ernst as she was known before her marriage to multimillionaire banker Eugene Meyer, was not quite the circumspect matronly type that her bronze statue suggests. During her youth, she actually had a notorious reputation among art and society circles as a social butterfly, a shameless gossip, and a flirt. Her radiant personality earned her the nickname “Sun Girl” in Alfred Stieglitz’s circle of avant-garde artists, and a spot as one of the most coveted subjects for painters, sculptors, photographers, and poets. Even after her marriage in 1910, she maintained scandalously passionate and intimate friendships with such powerful men as photographer Edward Steichen, Supreme Court Justice Oliver Wendell Holmes, and, of course, Charles Lang Freer. But Agnes’ carefree and punchy personality also made her a magnet for controversy. In 1970, more than fifty years after Freer’s death and shortly before her own, she published a memoir about their unique relationship entitled Charles Lang Freer and His Gallery. Told through the filter of memory and filled with previously unknown accounts of Freer’s personal life, this short pamphlet stirred up so much controversy that for a time it was banned from the Freer Gallery’s library. Full of tales of Freer’s philandering in Europe with Stanford White, his fiery temper later in life, and the “exquisite” quality of their personal relationship, Charles Lang Freer and His Gallery says as much about Mrs. Meyer as it does about Mr. Freer. Even the bronze bust itself, so modest and unassuming in appearance, stirred up controversy in the art world. 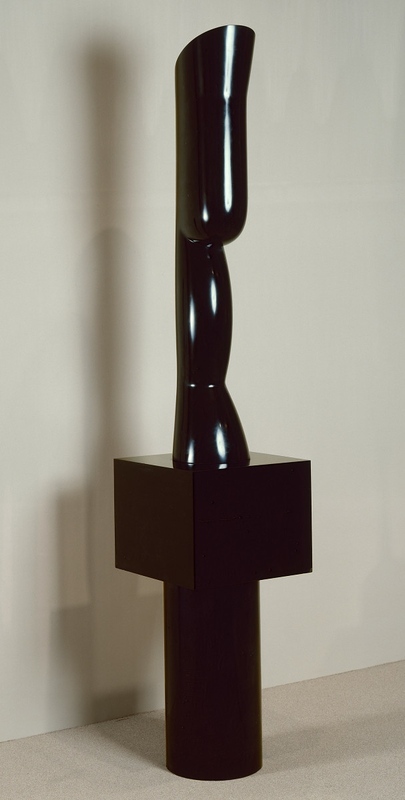 Upon hearing that his rival Charles Despiau had created a likeness of Mrs. Meyer, modernist sculptor Constantin Brancusi is said to have declared to her, “[I will show you] what a portrait of you is really like!” Three years later, in 1929, he finished a sleek, monumental black marble sculpture entitled Agnes E. Meyer: La Reine pas Dedaigneuse (the Not-Disdainful Queen), which towers seven-and-a-half feet tall. Even though it is hardly recognizable as a human figure, lacking the detail of Despiau’s bust, Brancusi’s work manages to evoke Meyer’s naturally intense and mesmerizing presence. Brancusi’s larger-than-life stylistic challenge to Despiau is now housed at the National Gallery of Art. So the next time you attend an event at the Meyer Auditorium, take a moment to consider the demure bronze bust that greets you on your way to your foreign film screening or scholarly lecture. If Agnes Meyer, for all her eccentricities, her love of gossip and mischief, and her affinity for controversy, could be immortalized as this proper and staid-faced woman, what other wild stories may lurk behind the manicured façade of the Freer Gallery?